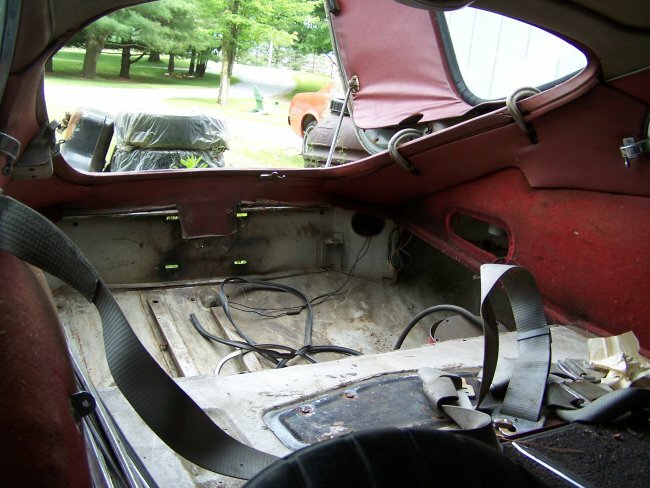 Welcome to my restoration pages for my 1963 Jaguar XKE Series I FHC (Fixed Head Coupe) #4150. 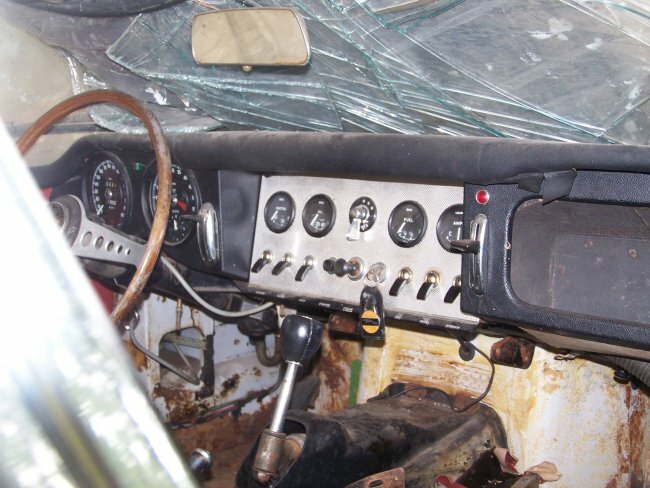 I will be updating these pages as I go through the restoration process, .though I tend to make more progress on the car then on the webpages. 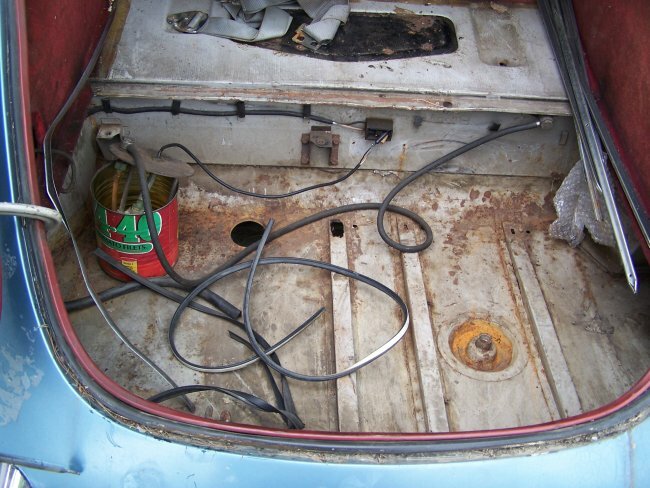 This is my first non-US car restoration and the most expensive restoration that I have undertaken. 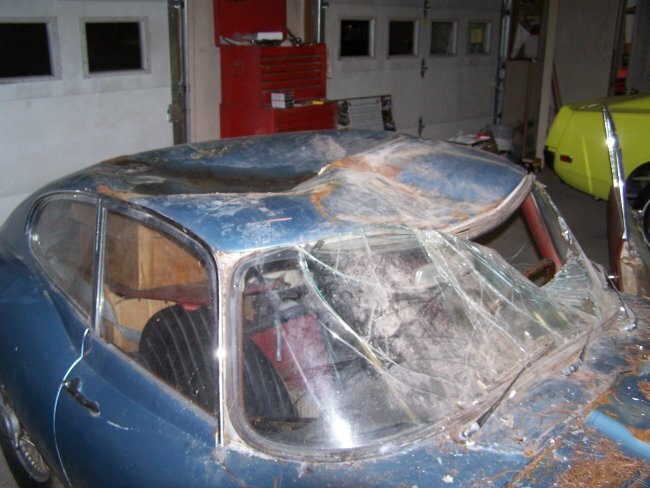 My past restoration projects can be see by going to The Garage Index. And so it begins. 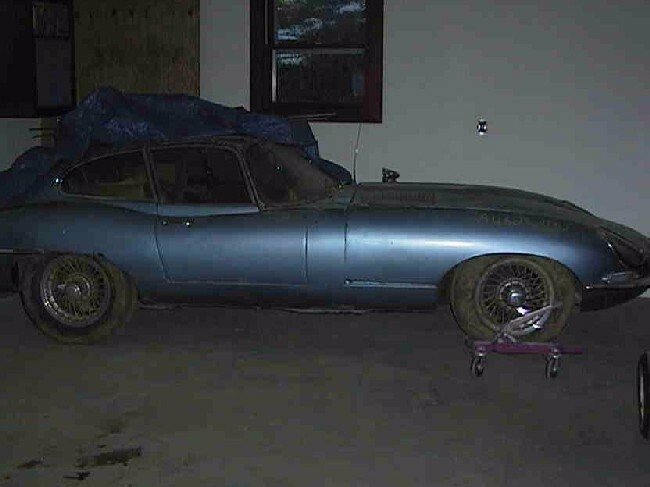 I've been sitting on this 1963 Jaguar XKE for about 4 years now and decided to start working on it before the rust got much worse. In the above pictures you can see what I had to start with. The car has had a rough life. It has survived at least 2 accidents and has been 3 different colors. At the time of the last repaint the entire bonnet assembly had been replaced with a factory new bonnet assembly. This must have been a significant expense for someone. Even today the price would be at least $10K. Prior to receiving a Jaguar Heritage Certificate the only history that I was able to determine came from the last real owner, David Lamphere of Westford, Vermont. David found the car behind a dairy farm in Addison, Vermont in the early 80's. He bought it for only $300! Apparently it was in very rough shape. The owner told David that while he was away fighting in Vietnam, his younger brother and friends used to race the car in the corn fields. When he got home he found that they had left it out in the elements, which probably the main reason for the deteriation. Through the years David only kept the car running. 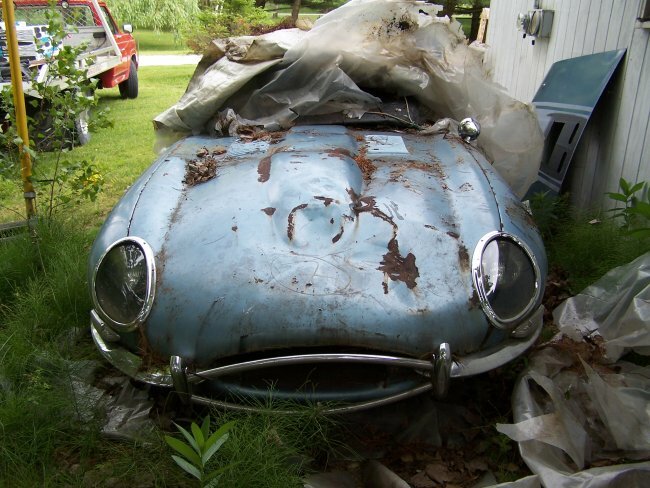 He kept the car stored in a barn with his family collection of Franklins and his wife's 1959 Jaguar XK 150. During the winter of 2001 the car collapsed on both Jaguars due to a heavy snow load. David barely escaped injury himself, having just left the barn shortly before it collapsed. 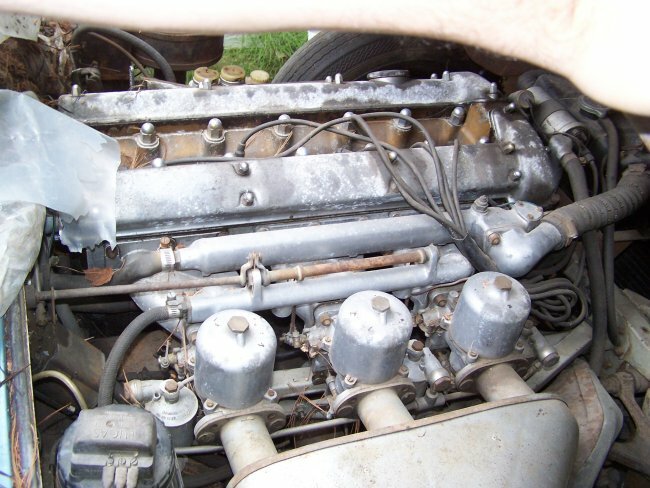 The XK150 Roadster was saved and was later restored (later to appear in Hemmings Classic Sports Car magazine). 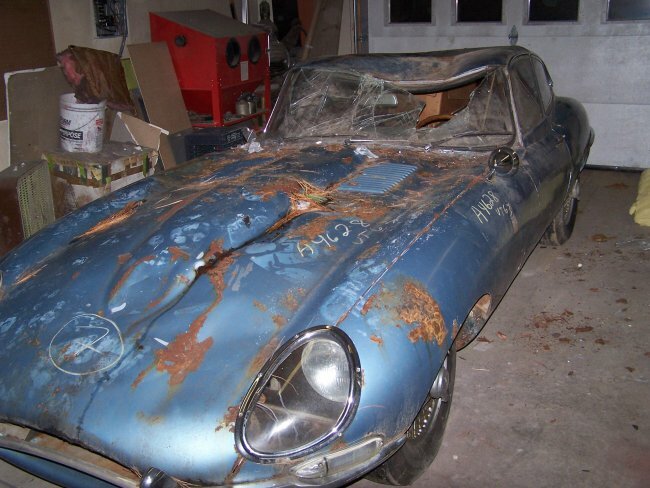 The XKE was considered a "Total Loss" by the insurance company and was sent to the insurance auctions. My father spotted the car while bidding on other collisions pieces and was able to get it for only $750 plus the buyer's fee. After sitting on it for a while he decided that he would never restore it, so I took it off his hands for $1200. The car sat on the side of my garage from summer 2003 to December 1, 2007 when finally it was pushed into the garage. Here you can see what I started with. 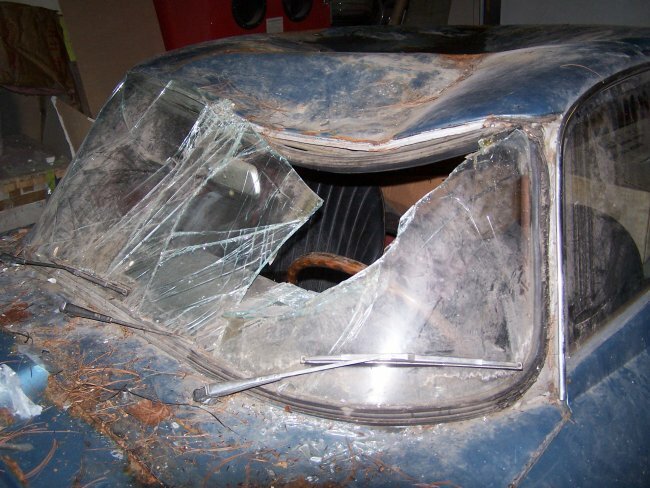 The damage looks pretty bad, but not for anyone with good collision repair experience. The hardest part was to locate a roof clip. I decided that I would not perform any work on the car until I could find a roof clip. Suprisingly, it only took me a couple months to acquire one. 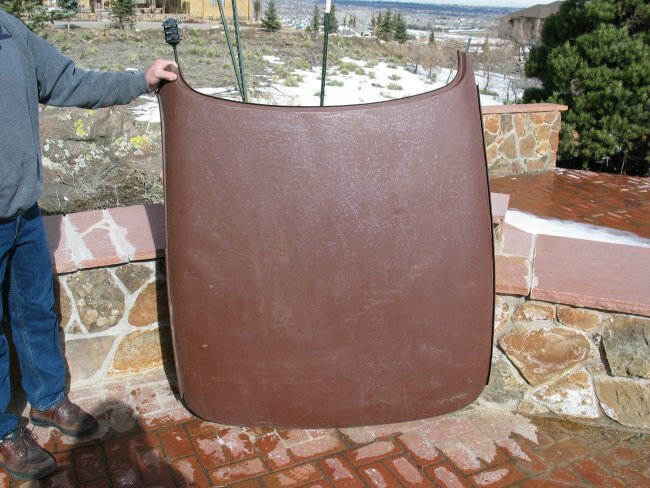 I had posted a want-ad on an internet forum and was lucky enough to get this roof from Gary Okonren of Okoren's Repair Service in Golden Colorado. Gary sold me this clip from a 1965 E-Type for only $540, which included shipping it across the country in a wooden crate. What an awesome deal ! The roof may looking rusty in these pictures, but what you see is actually primer. 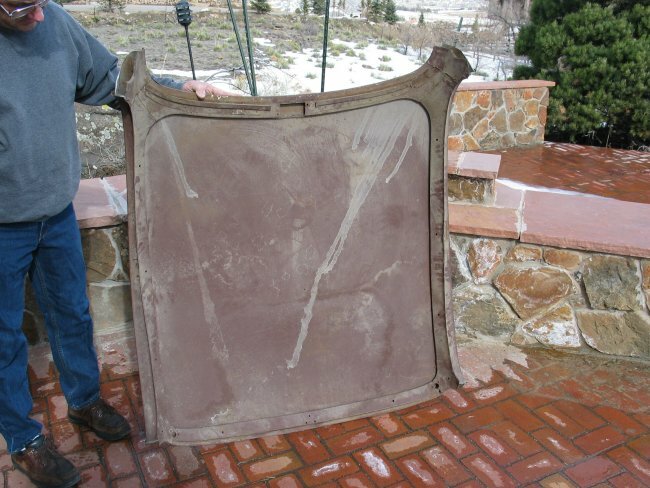 The roof clip will be stripped of this primer and will be sealed with a epoxy primer.